The Armistice of 1918 brought ceasefire to the war on the Western Front, but 'the Great War' would not as hoped be 'the war to end all wars'. 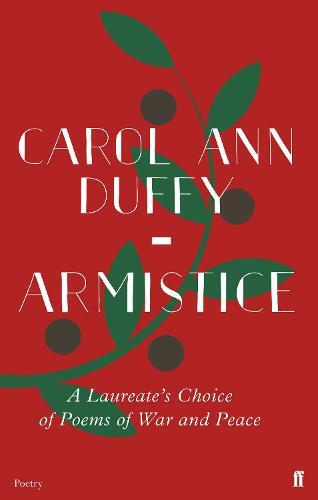 In this affecting selection, the Poet Laureate, Carol Ann Duffy, guides us deep into the act and root of 'armistice': its stoppage or 'stand' of arms, its search for truce and ceasefire. In 100 poems, our most cherished poets of the Great War speak alongside those from other conflicts and cultures, so that we hear some of the lesser-heard voices of war, including wives, families, those left behind. These poems of war and peace memorialise the horror and the tragedy of conflict. At the same time, in armistice, they become a record of renewal and a testimony to hope. A playwright and writer, Carol Ann Duffy is best known as one of Britain’s most popular and critically acclaimed poets and currently holds the post of Poet Laureate. Her best-known works include: Feminine Gospels, The World’s Wife, Rapture, The Bees and Sincerity and, as editor, 101 Poems for Children, Armistice and The Map and the Clock.